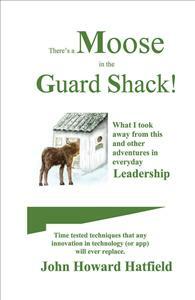 There's A Moose In the Guard Shack: He's Gonna Kill Me! Meet quirky characters that caused me mayhem (great learning experiences during my career), learn what I took away from the situations and how I used these lessons in the future. I searched for years for guidance that represented a better approach to solving the day-to-day problems consuming a leader’s time. Eventually, I realized I had the answer. “There’s a Moose” is exactly that—stuff happens and stuff gets solved—a common sense approach from my experiences over a career in leadership positions.